Play-Dead Murder Mystery Blog: Acting Community Thingumybogs present "Murder Me Always"
Acting Community Thingumybogs present "Murder Me Always"
The Acting Community Thingumybogs are not an ordinary amateur dramatics group. The are a non-profit group of volunteers who raise money for Save The Children Fund. The group is based in Carterton, Oxfordshire in the UK. They were also winners of West Oxforshire Arts Group of the year in 2009. 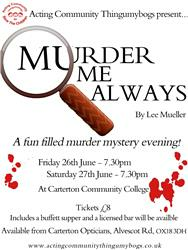 Friday June 26th and Saturday June 27th they will present "Murder Me Always" at Carterton Community College at 7:30 pm both evenings.